I don't have the salesman gene, but I do have the speaking experience. I spent eight years working for Dell, four of them as a technical trainer traveling the world. 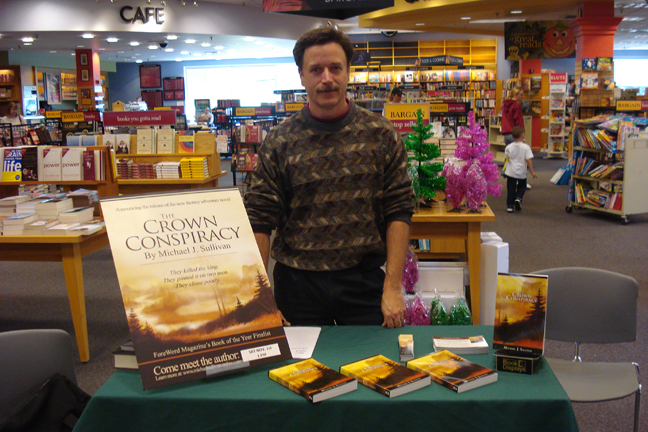 It was my second book signing at a flea market when I learned that a potential customer could be anyone. Unlike a signing at a bookstore, a LOT of people at a flea market simply do not read and will never buy your book. However I quickly learned that just because they do not read, they don't know someone who does. Getting in that second chance after asking if they would like to look at your book was hard after they shake you off and say no. Same thing happened at my last book signing. Being at a bookstore, everyone coming in read, but many did not care about a sci-fi, time travel, "what is Steampunk" book, but if you could get in that second chance, they had spouses, kids, friends etc that were into it and bought it for them. Thanks for this post. I have a tendency to downplay my own writing and this is a much-needed antidote to my self-deprecation. Did you know that you can shorten your long urls with Shortest and get $$$$ for every visit to your shortened links. This is one of the finest originality checking and for this follow the link site which will let you feel like you have the finest article which is really original. You will find a lot of hints on the personal statements writing but while you need some sample then click here here and you will get those sample so easily. There are some people who really wish to buy more essay so that they source in the site before buying a ready-made essay and then they use it for their work. Good post,Run amusement is the diversion for the android clients. It is basic and necessities your psyche to play this amusement. Diversions hone the human personality and it is a decent movement but you can get great site for best work. Everybody should play the diversion for this reason and after this give some an opportunity to unwinding to the brain. Wonderful post,Thousand of the Mexican individuals challenge the US President trump approaches. The protestor says that we never need segregation and they need correspondence but you can visit http://www.passivevoicechecker.com/use-passive-voice-corrector-online/ to manage your task. In excess of 20,000 individuals went to this March as per an official estimation. What's more, we should turn out and about against these prejudicial approaches.